Let’s just call it quits, people. Over the last couple of weeks, Mother Nature has decided to remind all of us who’s really in charge. After purchasing a house from the previous owners who failed to disclose that it was actually a destination spot for the deadly brown recluse spider, the latest owners began discovering spiders everywhere until they were eventually bursting out of the walls. A conservative estimate of 6,000 spiders were said to be lurking in the house. Then there’s THIS incident where some human needed to change a tire on the side of the road and got in the way of a bunch of ants’ business. 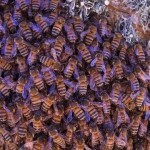 In Arizona several landscapers got too close to a 100 pound hive of Africanized Bees that had taken up residence in the comfy attic of a home the landscapers were working around. So…what have we learned this week? To be terrified of basically everything around us. What would you do if a bee stung one of your friends while he was visiting your house? Would you shrug it off and continue enjoying the day? Would you grab a can of Raid or a water hose and extract some minor vengeance? Or would you pump the hive full of gasoline and blow it to bits causing the local fire station to be scrambled? If you chose gasoline – congratulations, you have a kindred spirit in Lynden, Washington. A Lynden man dumped gasoline on a beehive that was in a tree and then ignited it Sunday night, Aug. 28, causing an explosion in the suburban neighborhood that could be seen from a few hundred feet away. The man lit the hive on fire about 8:30 p.m. in retaliation for a bee sting one of his friends got earlier that day at the house on Twin Sister Loop, said Lynden Fire Chief Gary Baar. In Red Hook, Brooklyn, a beekeeper noticed that a hive had begun to transform and display mysterious stripes of color in their honey stomachs. Even stranger, instead of honey, the hive began to produce a bright red substance that resembled maraschino cherries or Robitussin. The beekeeper began to suspect that the hive was bypassing the local flora and heading straight for the maraschino cherry juice at the local Dell’s Maraschino Cherries Company. Additionally, the beekeeper noticed that, “When the sun is a bit down, they glow red in the evenings,” he said. “They were slightly fluorescent. 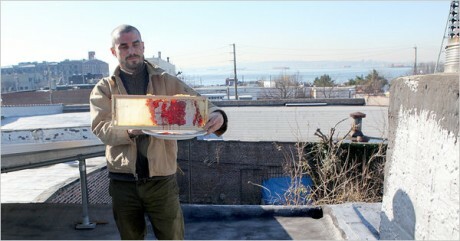 And it was beautiful.” Repeat: We have red, glowing bees in Red Hook! There is no word yet if the maraschino cherry honey is delicious. You are currently browsing the archives for the Bees category.